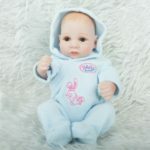 A reborn doll is a manufactured skin doll that has been transformed by an artist to resemble a human infant with as much realism as possible. The process of creating a reborn doll is referred to as reborning and the doll artists are referred to as reborners. Made of soft silicone vinyl, 100% safe and comfortable. 11 inches about 28cm baby doll. Closed eyes can not open, seems like that the baby is sleeping. Dark brown curly eyelashes, eyelash color and hair color coordinated. Warm and humid, look natural and soft , you can not help but want to kiss. The skin is the most unique place on this doll, designers will spend a lot of time to make baby&apos;s skin looks more realistic. Doll limbs can be active, it can sit or lie, silicone vinyl doll can enter the water, can not stand, speak or feed. Great as children birthday gift, children play toys, Christmas gift for your babies or your lovers and also collection by collection lovers.